Lonza Group AG acquired Micro-Macinazione S.A., a leading provider of micronization services and equipment, in the year 2017. Los Alamos National Laboratory, one of the US’ leading nuclear laboratories, developed a new nuclear micro-reactor in 2018 with multipronged applications, ranging from providing electricity in remote areas to powering space missions. A cohort of researchers from the University of Helsinki in Finland have developed a 3D printed microreactor device that enables them to gauge chemical reactions effortlessly and to enhance their research processes. Researchers from Osaka University in collaboration with Crystal Optics Inc., a prominent manufacturer of plating and polishing products, developed a low-cost manufacturing method of microstructures, including microreactors, by using Water-CARE technology. This report features key players operating in the microreactor technology market, including Soken Chemical & Engineering Co., Ltd., Bronkhorst (UK) Ltd., Chemtrix B.V., Little Things Factory GmbH, Ehrfeld Mikrotechnik BTS GmbH, Micronit Micro Technologies B.V., AM Technology Co., Ltd., and Vapourtec Ltd. 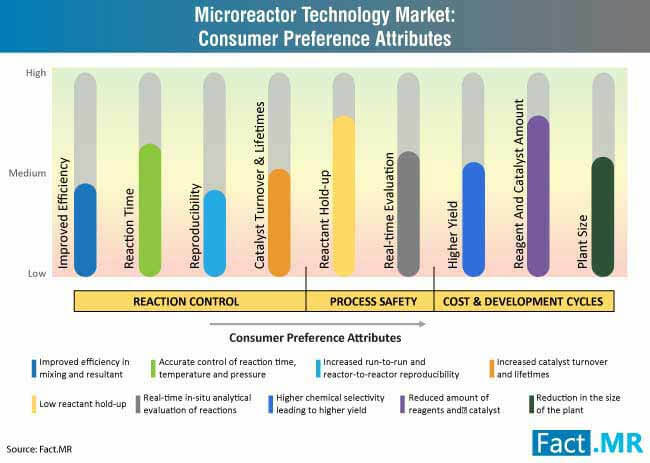 Note: Fact.MR’s study provides compelling insights on the microreactor technology market. A summary of the report is available upon request. Tier 3 players hold the hegemony in the microreactor technology market, with a revenue share of nearly 40%. Focus on specific product segments, along with volume sales through the development and maintenance of an adequate product supply, remains one of the primary agendas among the emerging players in the microreactor technology market. . However, higher dependency of tier 3 players on contracts has arrested enhancements in their product portfolios and technological developments. 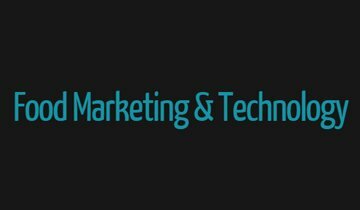 Meanwhile, the tier 1 players in the microreactor technology market remain focused on novel drug delivery system launches, and strategic alliances with the regional players to extend their market footprint. These players are also oriented toward expansion of manufacturing facilities in regions with significant growth potential, such as India and China, to capitalize on the emerging opportunities. Note: For exhaustive coverage of all the key insights of microreactor technology market, get in touch with our experts. Resurgent growth of chemical industries in the past few years has meant that demand for process intensification to achieve optimal results has also taken off. Microreactor technology has gained widespread acceptance among manufacturers of fine as well as specialty chemicals who seek streamlining their production costs while tackling environmental challenges. Additionally, high compatibility of the microreactor with mixing operations, such as mass transfer and heat transfer, have improved its visibility in the overall chemical industry landscape. 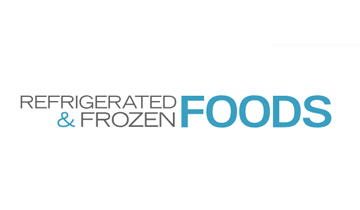 Microreactor technology is expected to witness high traction, as it facilitates one-step reactions, while eliminating the risk of alternate reactions, which results in greater polish and higher yields of finished products. Provision of clarity on crucial operational parameters, and enabling seamless process flexibility along with enhanced productivity, are other aspects driving demand for the microreactor tehnology. Microreactor technology is further expected to continue gain momentum with its greater speed and convenience compared to the conventional processes in various mixing applications. Drug development processes in the pharmaceuticals industry are witnessing notable refinements in the internal processes, in line with the evolving market pressures. With the drug development costs being extremely high, key pharmaceutical companies are vying to come up with new products in the market space and enhance research and development throughput. Ability of microreactor technology to decrease time-to-market, which remains one of the highly valued aspects, is empowering its adoption in case of drug development processes. Solid evidences demonstrating higher gains achieved, with reduced development times and enhanced productivity, have necessitated adoption of microreactor technology in the pharmaceutical landscape. Microreactors are set to evolve as a standard tool for pharmacists to achieve production scale-up, which is one of the prominent bottlenecks of a drug development process, along with improved R&D efficiency. Rising clamor for energy resources across the globe and increasing concerns of global warming have induced a massive shift toward biodiesel as an alternative fuel with low environmental detrimental impacts. Microreactor technology helps in carrying out faster transesterification, a commonly accepted technique for biodiesel production. Types of microreactors used in case of biodiesel production come in various structures and shapes that are designed in a way to facilitate proper mixing and reaction. Biodiesel production by transesterification using microreactors offer the convenience of faster reaction rates and increased rate of product synthesis, thereby resulting in higher gains within reasonable time period. Capillary microreactors have been reported as one of the first ever microreactor types utilized in biodiesel synthesis. Note: For a comprehensive analysis on all the key dynamics of microreactor technology market, request a sample. A microreactor, otherwise known as micro-structured reactor or micro-channel reactor, refers to a device wherein chemical reactions occur in a confinement with typical lateral dimensions of less than 1 mm. Microreactor technology offers multiple advantages over the conventional technologies in terms of drastic improvements in energy efficiency, speed of reaction and higher yields, high inherent safety, upgraded reliability and scalability, and finer process control. Fact.MR recently published an all-inclusive forecast study on the microreactor technology market to find out the prevalent opportunities over the forecast period of 2018 and 2028. The utmost objective of Fact.MR report on microreactor technology market is to provide compelling insights on the overall market scenario, demand generating factors, dynamic aspects, and key product developments in the microreactor technology market. Also, the research study on microreactor technology market addresses some of the precise and reliable figure estimates about futuristic prospects of microreactor technology market, both in terms of value and volume. The microreactor technology market report has been segmented on the basis of product type, by mixing, by phase type, by usability, by material type, and by application. By product type, the microreactor technology market has been segmented into T-reactor and falling film micro reactor. By mixing, the microreactor technology market has been segmented into round bottom flask micro reactor, jacketed microreactor, and asia microreactor. 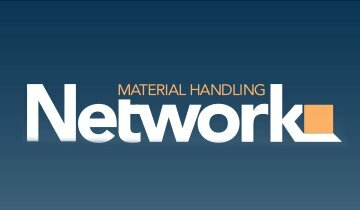 By material type, the microreactor technology market has been segmented into metal and metal alloys, ceramic, glass, quartz, plastic, and silicon. By phase type, the microreactor technology market has been segmented into liquid phase microreactor and gas phase microreactor. By usability, the microreactor technology market has been segmented into disposable and reusable. 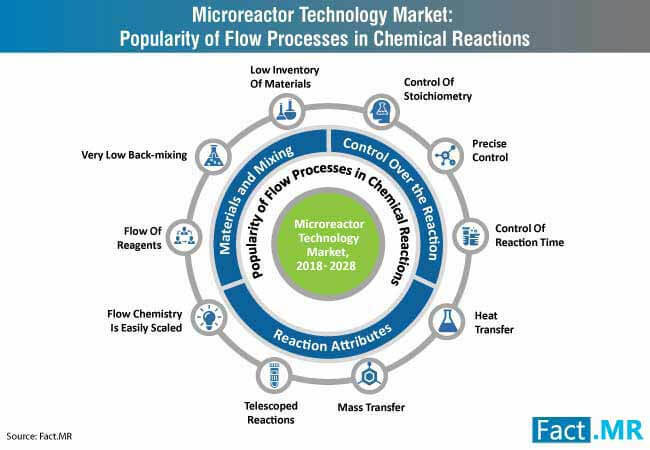 The end user segments in the microreactor technology market include specialty chemicals, pharmaceuticals, commodity chemicals, and research laboratories. The information compiled in the microreactor technology market report serves as a highly credible source for the readers, which can help them to understand historical and forecast data of the microreactor technology market. The report on microreactor technology market also addresses some additional queries in relation with the growth trajectory of microreactor technology market, which are instrumental for the readers to make fact-based decisions and gain a sustainable edge in the microreactor technology market space. Which are the major opportunities in the emerging countries which the microreactor technology market players should capitalize on for revenue benefits? 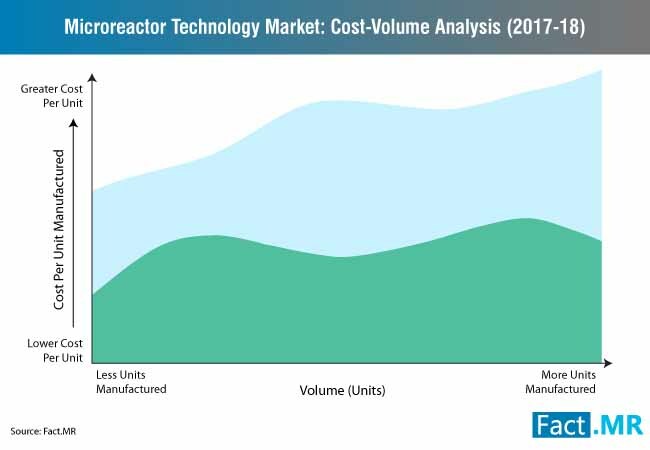 Which region accounted for the hefty revenue share in 2018 in the microreactor technology market? Which will be the top-selling product type in the microreactor technology market space? What are some of the strategic moves helping prominent players of microreactor technology market to have a strong market sustenance? The insights on microreactor technology market included in the research study have been subjected to authentication and validation of data by seasonal experts and industry giants. The unique research methodology followed in the microreactor technology market report represents a robust approach to gauge the parameters portraying growth aspects of microreactor technology market over the forecast time period.